1. Defrost the chicken beforehand so it’s ready when you want to knock up these appetizers in minutes. 2. Mix the coleslaw in with the chicken cubes. 3. Add a 1/2 of a teaspoon of all the spices listed above including 1/2 teaspoon of salt. Add a handful of fresh chopped up coriander to taste. 4. Add about 5 tablespoons of gram flour (note, pakoras won’t work with any other flour). Add some cold water to the mixture and stir in properly ensuring there are no bubbles in the flour. You want the consistency to be smooth, heavy and not too watery otherwise it will be difficult to fry. Judge for yourself how much gram flour and/or water you need to keep adding to get the texture and consistency right. 5. Using a spoon or your hand, just pick up the mix and place it into hot oil. Cook for longer on a lower heat so that the chicken is cooked thoroughly. You can then turn the heat up and fry them until golden and crispy. Recommendations: Pakoras are best served hot and can be served with a variety of sauces including any type of hot sauce/chilli sauce, plain yogurt, or tamarind sauce. These look sooooo good. Do you think you can bake these instead of frying them? 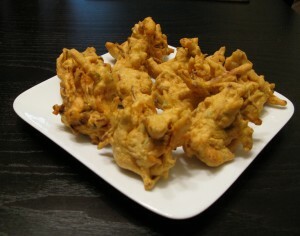 I’ve never tried to bake pakoras, but I don’t see why it can’t be done. Let me know how it works out for you. I have made these and baked them for my son. I did a yogurt wash and dredged in the mixture and then baked them.